One of my favorite spots in the Keys is a huge, bowl-shaped tidepool just off U.S. 1. Protected from wave action by a sea wall of coral rock rubble, this pool is a giant natural aquarium. Dozens of species of macroalgae occur here. By far the most common are members of the large genus Caulerpa. C. proliféra has a simple flat blade (botanically, the "assimi-lator") that often spirals like a loose corkscrew as it grows upward. C. mexicana has a blade more reminiscent of a fern frond, that is, it is deeply notched. Less common species include C. racemosa, in which the blade looks like a bunch of grapes; C. peltata, which has an upright central stem with little lollipop-shaped "leaflets" attached along its length; C. sertularioides, with a blade that looks like a bird's feather; and C. verticillata, with short blades composed of a central thread bearing tufts of side filaments arranged in whorls along its length. These species of Caulerpa are adapted to scrambling over rubble, dead coral heads, and similar hard, irregular substrates. In the aquarium, arrange specimens attractively on top of a rock positioned in good light, and they will soon attach themselves and begin to grow. 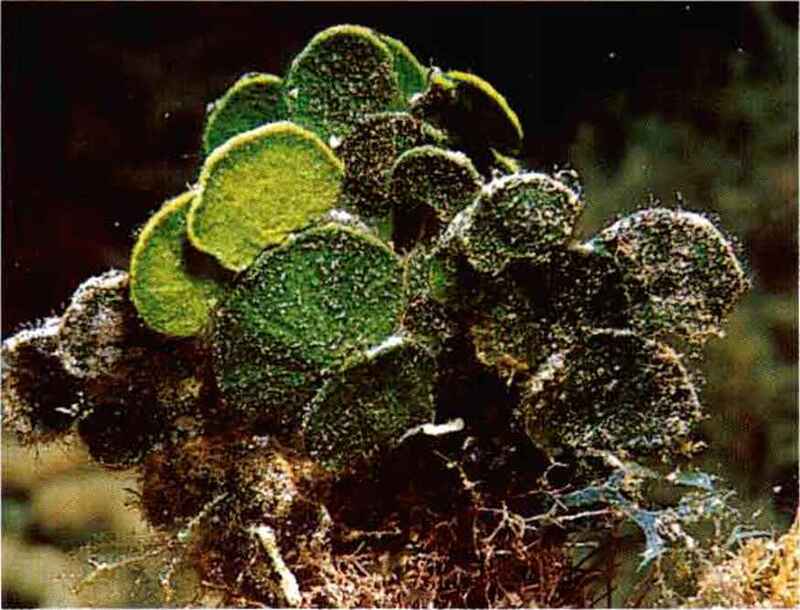 Other species of Caulerpa are adapted to life in sandy or muddy habitats. These include C. paspaloides, which produces a tall, stiff blade crowned with feathery branches that give the overall appearance of a palm tree; C. cupressoides, with tough, squarish blades that are toothed along the edges; and C. lanuginosa, the blade of which is a fat, rounded rod covered with little projections that give it the appearance of a spruce tree branch. These three species require a fine substrate. Under optimum conditions, growth of Caulerpa can be as much as an inch a day, so pruning will be necessary. The prunings can be fed to herbivorous fish or can be used to start new plants. A single blade of any Caulerpa can be partially buried in sand and will form a complete new plant within a few weeks. Natural growths of Caulerpa are probably "pruned" regularly by algae-eating animals. Pruning seems to be important in preventing Caulerpa from undergoing sporulation, a process in which the internal contents of the blade become reorganized, forming free-swimming reproductive cells. The first time I observed this phenomenon, I was amazed at the speed with which the changes in the seaweed occurred. At first, the blade takes on a veined appearance, as green chloroplasts cluster around cell nuclei and new walls of cellulose partition off the blade into myriad tiny packages. Within a few hours, these spores will be released into the water, each endowed with a flagellum that permits it to swim, leaving behind the dead, translucent husk of the parent. Giant Fanworm CSabellastarte magnifica): fascinating to behold and one of the best invertebrate choices for beginners. 158 Natural Reef Aquariums giant fanworm, Sab ellas tar te magnifica extends its feathery fan, feeding on plankton. These worms, preferring quiet, sheltered locations, are common in boat slips and on submerged pilings. 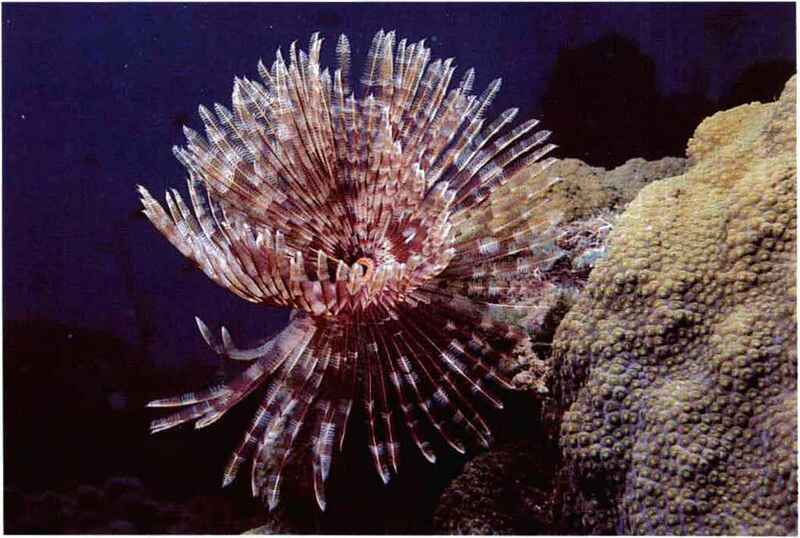 Other species of fanworms, though none as large as Sabellastarte, are abundant in such areas as well. reproduction in Bar- snapping partner, the Curleycue Shrimp (Alpheus armatus). tholomea and sexual reproduction in the other substrate. As a student and in my salad days as a biology two species (actually, instructor, I observed these lovely invertebrates on numer-the release of sexually ous expeditions to Pigeon Key, directly underneath the old produced offspring Seven Mile Bridge. At the edge of the island, not quite un-from a brooding "fe- derneath the bridge, and thus in full sun for about ten hours male" in each case) in a day, lay a patch of gravelly sand dotted with Phymanthus the aquarium, suggest- crucifer. Since collecting around the island was forbidden, ing possibilities for this patch had been undisturbed for a long time and covered captive propagation. many square yards. At low tide, the area was left high and Rock or Flower- dry, the gravel moist and cooling as seawater evaporated un-Anemones (Phyman- der the terrific sun. The anemones would be withdrawn into thus crucifer) live in the gravel, waiting for the sea to return. When it did so, they crevices between the would slowly emerge, revealing their intricate colors and cobbles, often in only a patterns as they stretched to expose themselves to the sun. few inches of water. The anemones were of every hue possible for this species, When the rocks are ex- and I spent hours wading in that "flower garden," admiring posed at low tide, or the seemingly infinite variations. from which trait its common name is derived. This tion from shrimp-eating fishes, owing to the stinging anemone will not only sting other anemones, it can eat tentacles of the anemone. 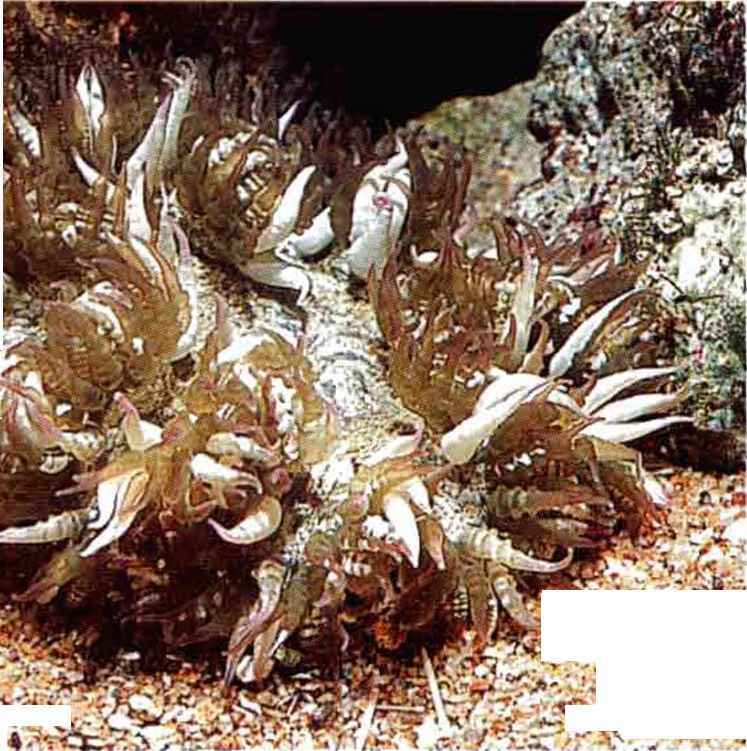 of the anemone live pairs of Curleycue Shrimp (Alpheus tinctive swaying movements, advertise the services of armatus). Males can be distinguished by their striped an- cleaner shrimps to fishes seeking removal of parasites and tennae. Each pair of shrimp stakes out a particular anemone dead tissue. Fish approach the shrimp's "cleaning station"
Spotted Cleaning Shrimp (Periclimenes yucatanicus) on a Florida Pink-tipped Anemone (Condylactis gigantea). 160 Natural Reef Aquariums body, moving about — even inside the mouth and gill cov- protection from predation that true cleaner shrimps enjoy, ers — extracting parasites, dead tissue, and loose scales. (Fish rarely eat cleaners, as the latter provide a valuable ser-These the shrimp eats, so both fish and shrimp derive ben- vice.) P. yucatanicus associates with Condylactis gigantea and efit from the cleaning relationship. A hippolytid shrimp, Thor amboinensis is probably not Bartholomea, the Curleycue Anemone, a cleaner but is always found in association with anemones. 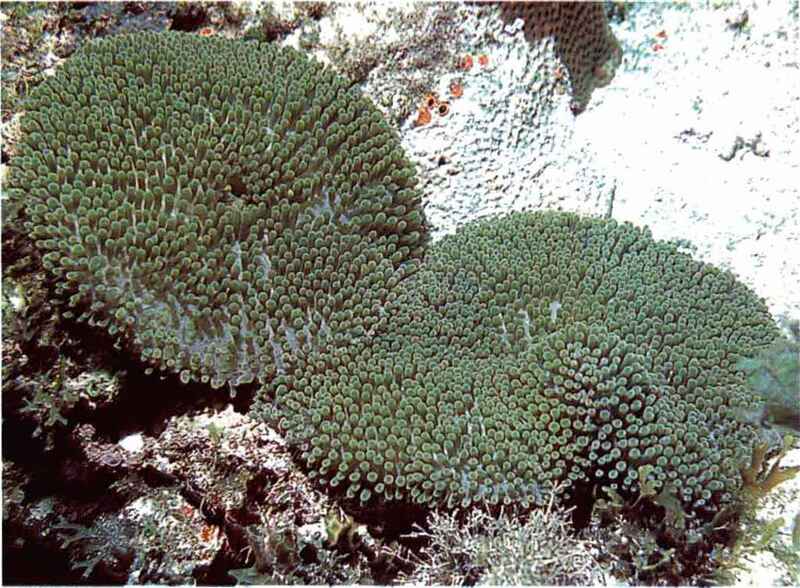 In the Atlantic, it associates with the Curleycue Anemone and the Atlantic Carpet Anemone, Stichodactyla helianthus. (The latter anemone species is not a good aquarium subject.) These delightful little shrimp were once readily available, but now are rarely imported. It must, like all other anemone shrimp, be kept with an appropriate host. Thor occurs in the Indo-Pacific as well as the Atlantic and Caribbean. 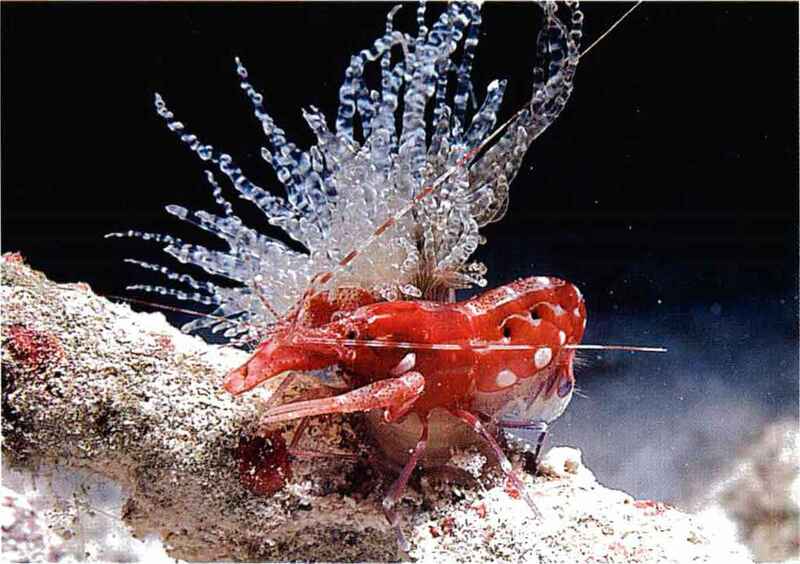 In the Indo-Pacific, this shrimp associates with corals such as Heliofungia, as well as with various anemones. 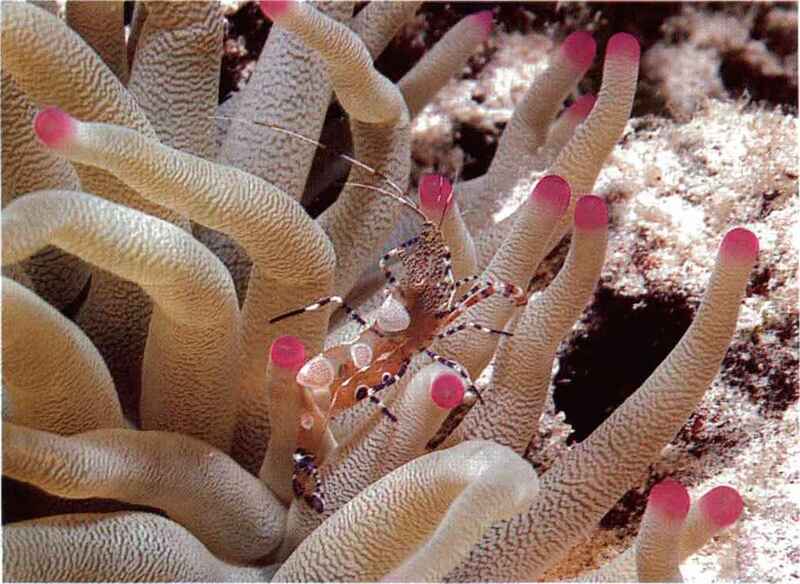 Most anemone shrimp species belong to the Family Palaemonidae and to a single genus, Periclimenes. One should obtain the shrimp and its host together. Mated pairs of shrimps are sometimes available, and the two will share a single anemone. Otherwise, attempting to keep two shrimp in a single anemone may result in a territorial squabble. Pederson's Cleaning Shrimp (Ppedersoni) occurs on several anemone species, perching in the tentacles and swaying back and forth to attract "customers." 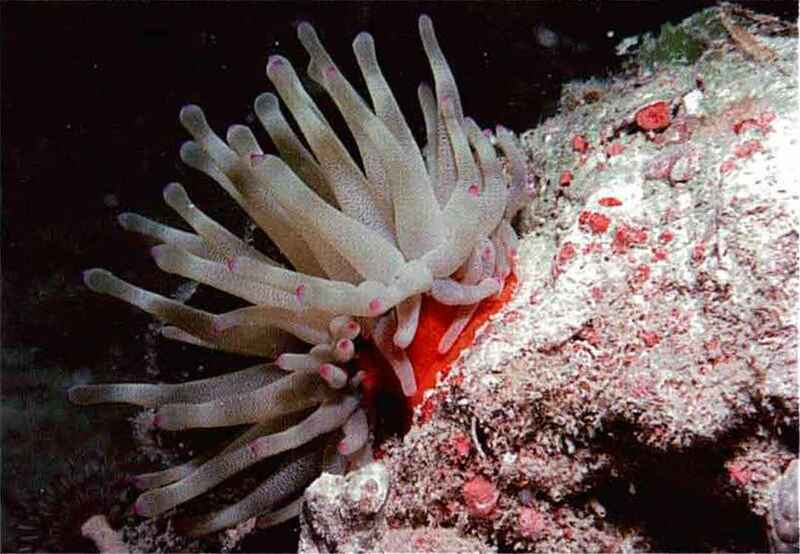 It rarely leaves the anemone, except to carry out its cleaning services. The body of this shrimp is transparent, with attractive white and purple stripes. Like most cleaners, it has white antennae. It grows to just over an inch in length. P yucatanicus is a bit larger, also transparent, and is marked with distinctive tan and white saddles on the back of its carapace. The legs are banded in white and purple, and there is a series of purple dots, surrounded with white circles, along the sides of the abdomen and on the upper surface of the tail. The antennae are white, but there is no direct evidence that P yucatanicus is actually a cleaner. It may be a false cleaner, Florida Pink-tipped Anemone (Condylactis gigantea): note mimicking the behavior in order to benefit from the same shrimp hiding deep in the mass of stinging tentacles. Commonplace in the inshore zone is the tiny Tricolor Hermit Crab, Clibanarius tricolor. 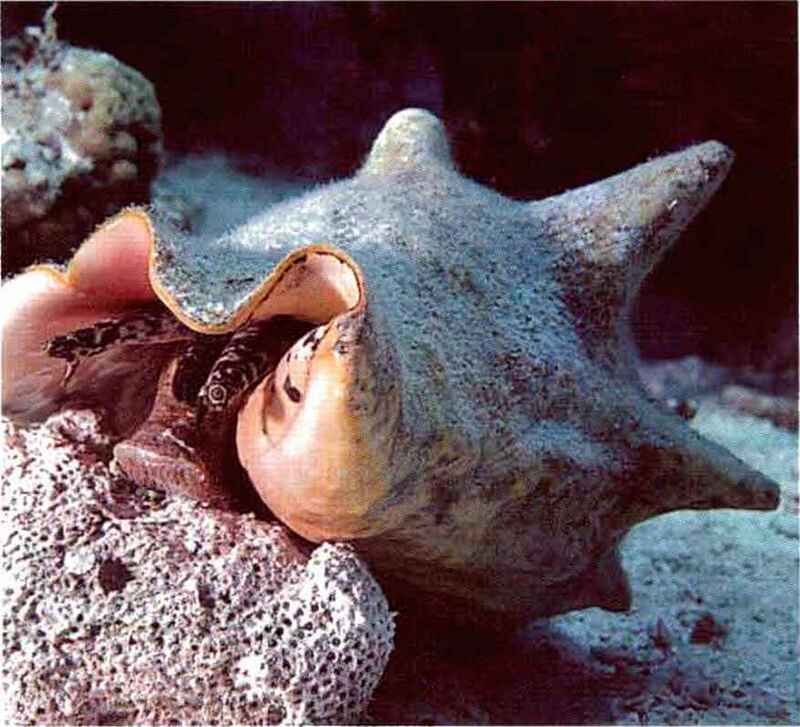 All hermit crabs protect themselves by making use of the discarded shell of a dead snail, and this species is usually found in the small shell of a common species, Bat-telaria. Hermit crabs are found on all shores, and most species from the Tropics are colorful. The Tricolor Hermit s name derives from the red, yellow, and blue markings on its legs. It is seldom larger than an inch. Being very hardy, hermit crabs are often the first invertebrate to be kept by the beginning aquarist. A few hermit crabs can be included in any marine aquarium and make excellent scavengers. Make sure that the species is not one that grows large, however, since large hermits can be destructive. Throughout the inshore zone, among rubble, under rocks and in crevices, brittle stars abound. While not particularly popular with aquarists, owing to their secretive habits, brittle stars make a fine addition to the aquarium. Many species sport attractive colors and patterns, and all are excellent scavengers, coming out at night to feed on bacteria, plankton, debris, or bits of dead animal matter. One species, the Reticulate Brittle Star (Ophionereis reticulata), is especially abundant among beds of the calcareous alga Halimeda. This brittle star has a unique way of defending itself against predators when it leaves the safety of the Halimeda to forage at night. When disturbed, its entire body flashes with a brilliant yellow-green light (bioluminescence). This reaction presumably dazzles the would-be predator, allowing the brittle star sufficient time to escape. Brittle stars are so named because they are easily damaged by handling. They will not survive in the aquarium unless provided with shelter into which they can retire to escape the light. 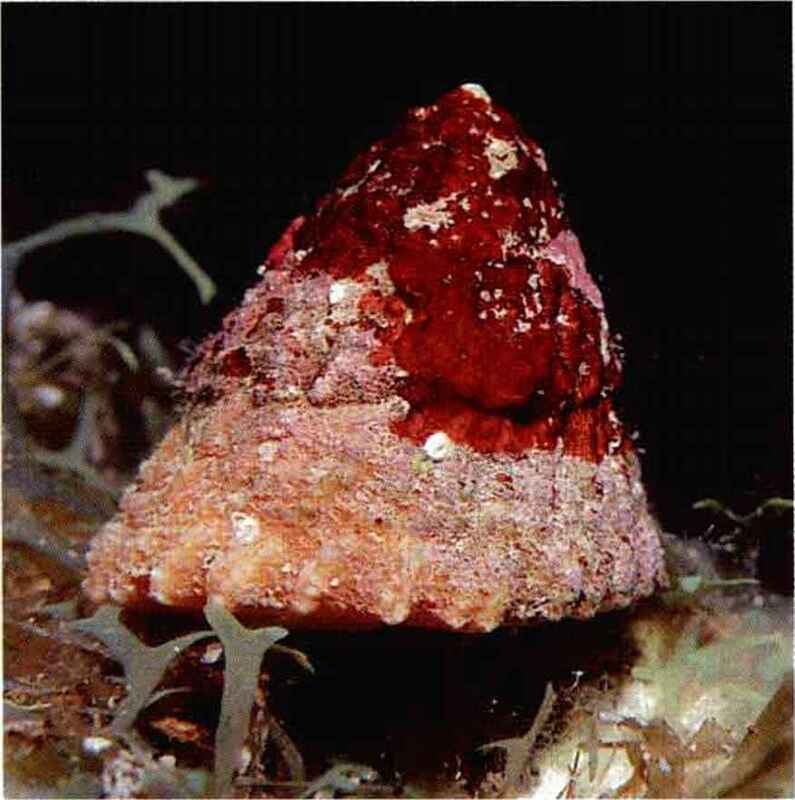 Another useful resident of the inshore zone is Astraea tecta americana, the American Star Shell. (Another subspecies, A. tecta tecta, occurs in the West Indies.) This mollusk (Gas-tropoda-Turbinidae) is valued by aquarists for its propensity to consume algal turfs. It also occurs in grass beds and on the back reef. Several species of keyhole limpets (Diodora, Gas-tropoda-Fissurellidae) are also found in the Keys, from shallows to great depths. 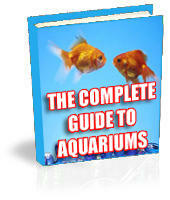 All of the shallow-water forms feed on algae, and so are often included in aquarium displays for functional, rather than aesthetic, reasons. Limpets are capable of reproduction in the aquarium, a trait which further recommends them to hobbyists. Fish species appropriate for this biotope would include any of the common shallow-water damsels, such as the Beau Gregory (Stegastes leucostictus), various wrasses, such as the colorful Bluehead Wrasse (Thalassoma bifasciatum), as well as numerous blennies of the Keys and the Caribbean that appear in the trade, often unidentified. Juveniles of many other species also pass through these shallows, and a young Blue Tang (Acanthurus coeruleus), French Angel (Pomacan-thus paru), Porcupine Puffer (Diodon hystrix) or Goldspotted Snake Eel (Myrichthys ocellatus) would not be out of place here, although any of these would outgrow a small tank. American Star Shell (Astraea tecta americana): an excellent algae grazer. stirred up makes it possible to duplicate the Turtle Grass gers. 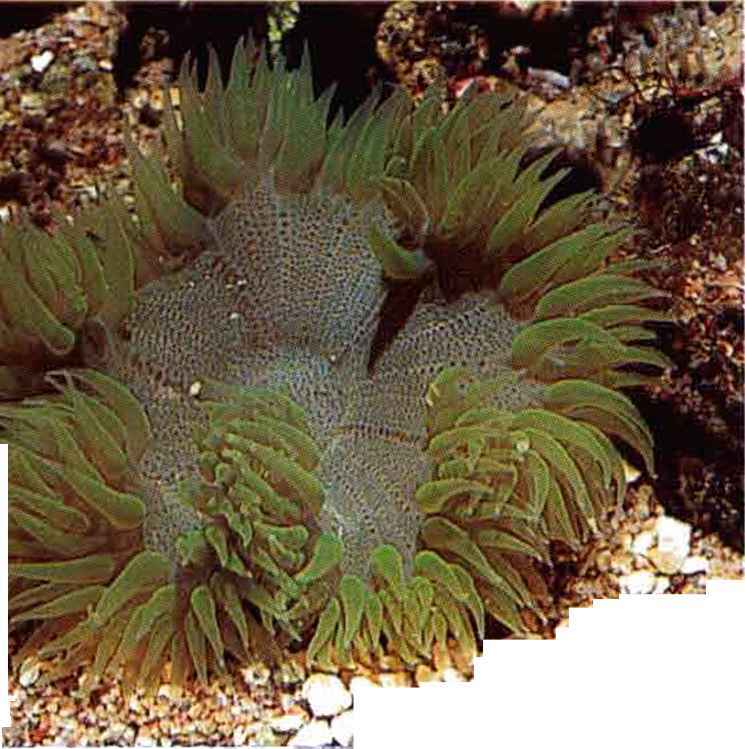 to greenish in color with or with- Florida Pink-tipped Anemone (Condylactis gigan- bers has resulted in these two out a definite pattern of shading. tea): common, inexpensive, and relatively hardy. 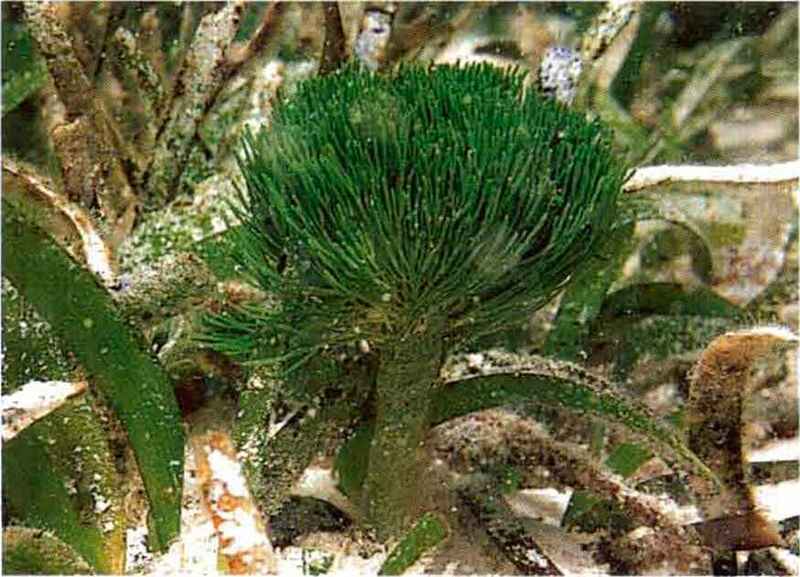 This species grows both in reefs and Turtle Grass beds, where it tends to be smaller. (.Hippocampus erectus) are other grass bed dwellers. Sea- advent of live rock mariculture. Some live rock farmers in horses have long been popular as aquarium subjects, but the Florida have already received permits to sell stony coral beginner should be warned that they are challenging to colonies that develop on their "rock farms." offered. Sea cucumbers and brittle stars will help to keep the tus)> an ever-active, attractive wrasse. Two other wrasses sand stirred up. Wrasse reaches only 3 inches in length, it is a good choice for a smaller tank. Several wrasses can be kept together and make for a consistently lively display. Many other larval and juvenile fishes are plentiful in the grass beds, where they find both food and shelter in abundance among the fronds. 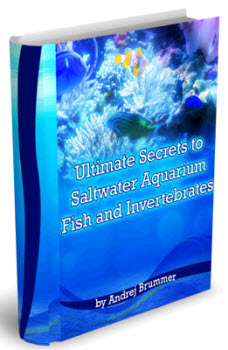 The choices are broad for this habitat, and a listing of fishes typical of the Keys area is included in Chapter Ten. Antler Anemones CLebrunia danae): branching tentacles. peatedly, not unlike the antlers of a deer. This is also known as the "Stinging Anemone" in south Florida. The latter name is descriptive — beware. Sea Mat colonies completely exposed Sea Mat or Mat Zoanthid at low tide, baking under the tropical CZoanthus pulchellus) sun at temperatures in excess of 100 degrees F. No wonder this species is hardy in the aquarium! It is less commonly available these days, due to collecting restrictions. enough and shelter is sufficient. 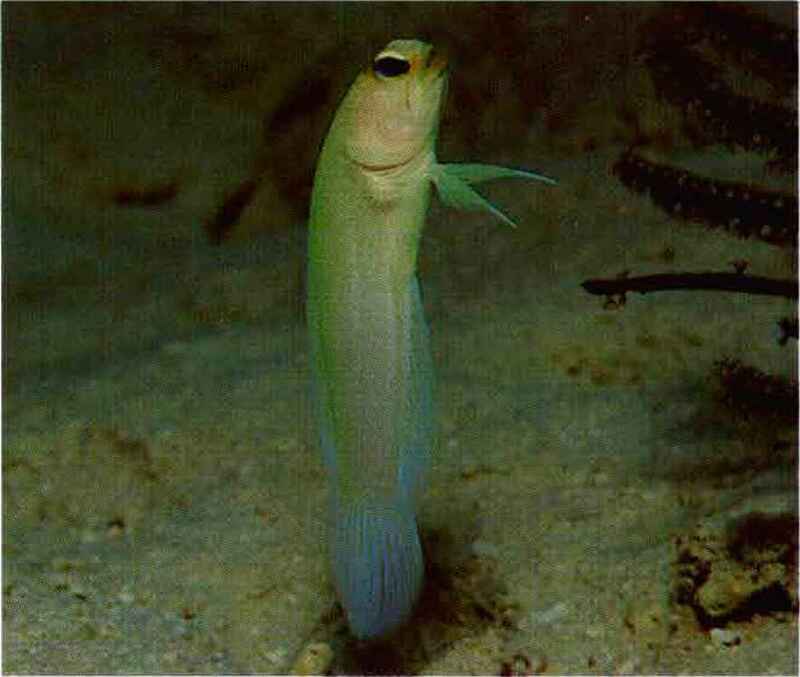 Do not place jawfish in an aquarium with anemones, however, as the fish is prone to becoming a meal for the cnidarian. 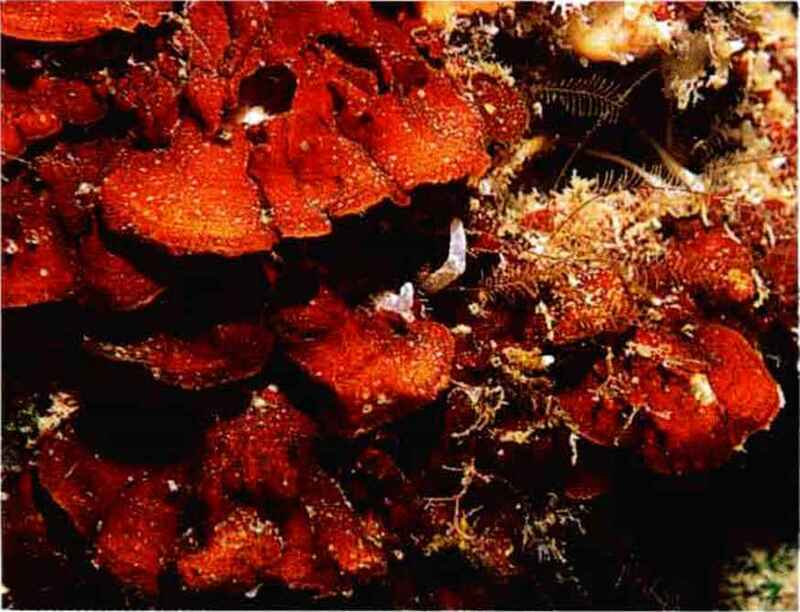 Instead, populate the aquarium with invertebrates from the grass beds (many of which are found in the lagoon) or with specimens of one or more of the soft corals discussed in the following section. and careful placement of a flat piece oflive rock, supported ate zone. 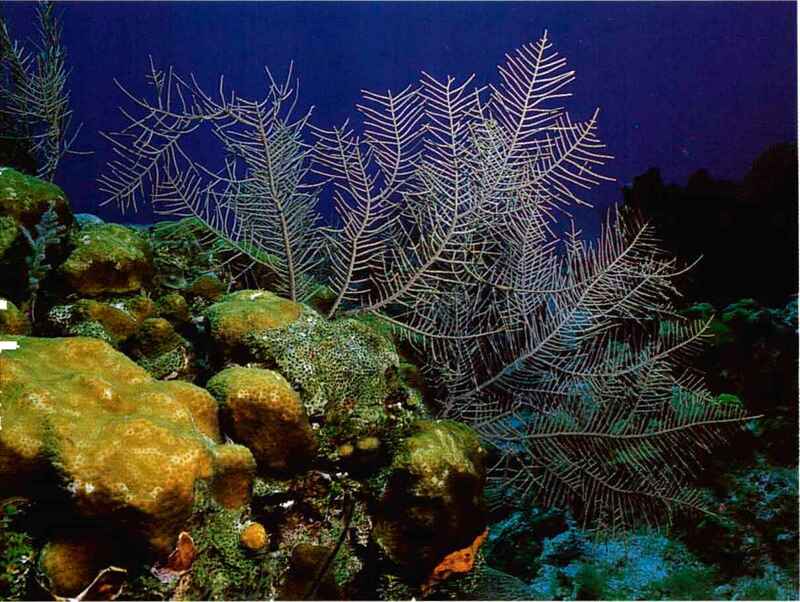 Gorgonacea includes sea whips and sea fans; colonies are branched and treelike, with the branches sometimes fused into a net (sea fans), or sheetlike, spreading over the substrate. In either case, they are stiffened by the protein gor-gonin, with or without calcified elements called spicules. In the upright species, there is an axial skeleton overlaid with cortical tissue (the colorful part of the creature) in which the polyps are embedded. 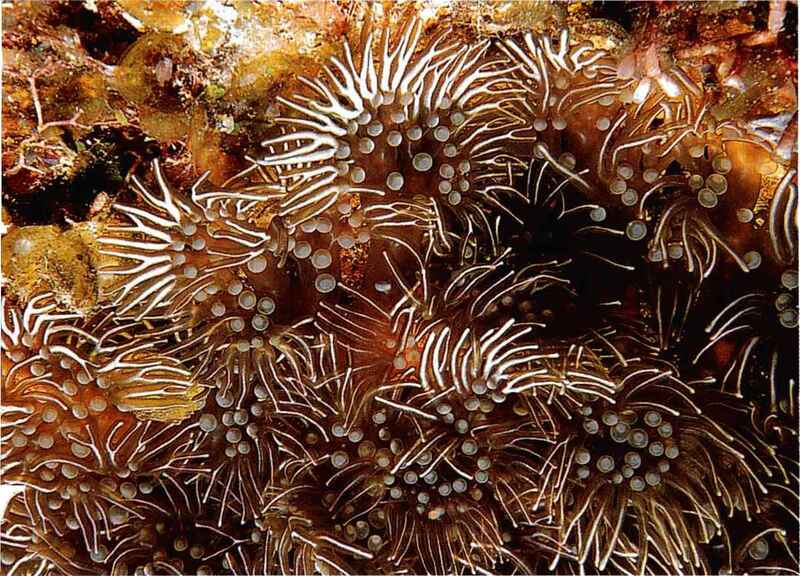 The axial skeleton is absent in the encrusting types of gorgonians. There are many families of gorgonians, and individual species maybe difficult to identify. Accurate identification is based upon the presence or absence of spicules and upon the shapes and colors of these elements when examined under a microscope. coping with the forces of moving water or wind. rum) colony: will spread under good lighting. my aquariums, starting from a single polyp attached to a piece of live rock. Another species that lacks a (Briareum asbestinum): readily regenerates, carbonate skeleton is Briareum asbestinum, also called Deadman's Fingers. The colony is genera. 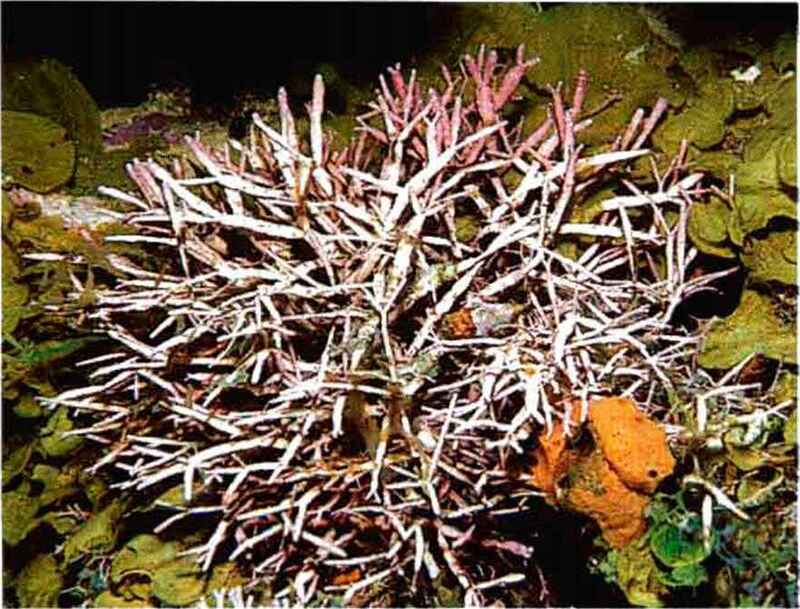 Collections from shallow water, as opposed to the composed of fat, pinkish brown branches with huge, feath- reef itself, will probably be dominated by species of Plexaura ery, brown polyps that appear fuzzy. Briareum sometimes and Muricea. Sea fans (Gorgonia spp.) are specialized gorgonians in which the flat branches are very finely divided and fused together to form a net. Sea fans are rarely seen growing inshore from the reef in my experience. Sea fans can be successfully maintained in aquariums suited to stony corals. Sea fans should be oriented so that they are spread perpendicular to the current. In fact, orientation may be an important key to success with most gorgonians. Sea fans are not regularly available in aquarium shops. On the other hand, sea feathers, Pseudopterogorgia and Pterogorgia, are frequently to be had. One common name often applied to these gorgonians is Purple Frilly Gorgonian. In these genera, the branches arise in one plane from opposite sides of a central stalk, creating the overall appearance of a feather. 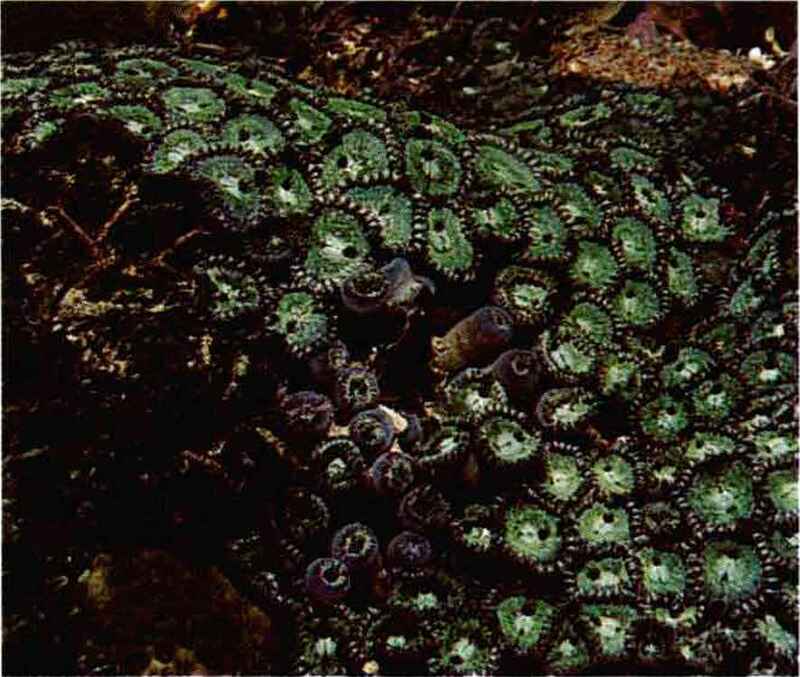 In Pterogorgia, the branches are flat, with polyps confined to the edges, while in Pseudopterogorgia, the branches are rounded and the polyps are uniformly distributed along them. 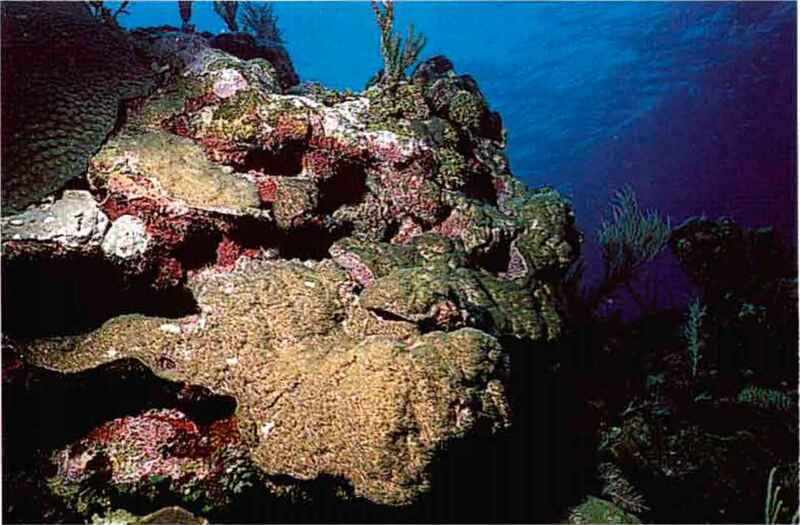 Gorgonians from shallow waters in Florida and the Caribbean are commonly photosynthetic and are colored purple, green, or brown, with mostly brownish or greenish polyps protruding from the skeleton. They fulfill the same ecological roles in the Caribbean that the leather corals fulfill in the Indo-Pacific. 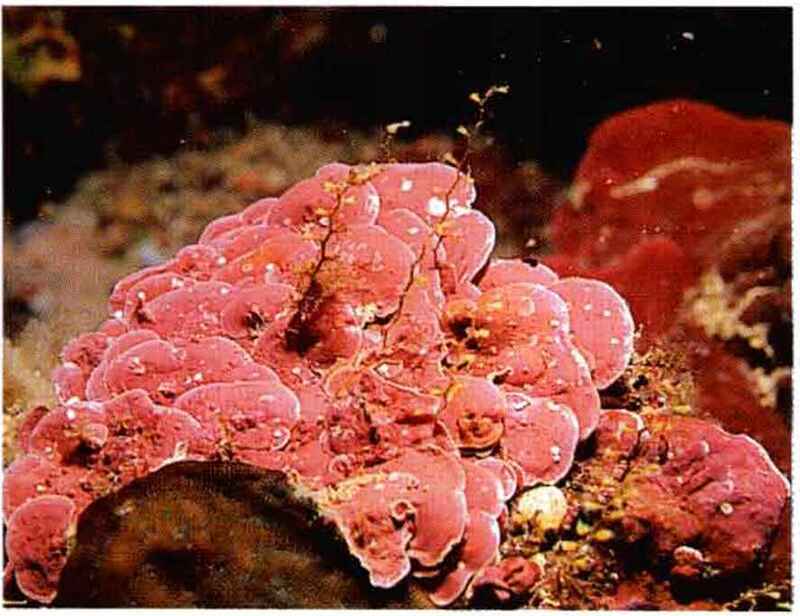 While sometimes regarded as difficult to maintain in the aquarium, photosynthetic gorgonians respond well to the same conditions provided for stony corals. They demand bright light and vigorous water movement. A well-established natural aquarium suits them, but it should have auxiliary pumps or powerheads controlled by a wavemaker to provide plenty of turbulence. Water movement is essential for all gorgonians, especially for those that are entirely photosynthetic and absorptive in their feeding behavior. 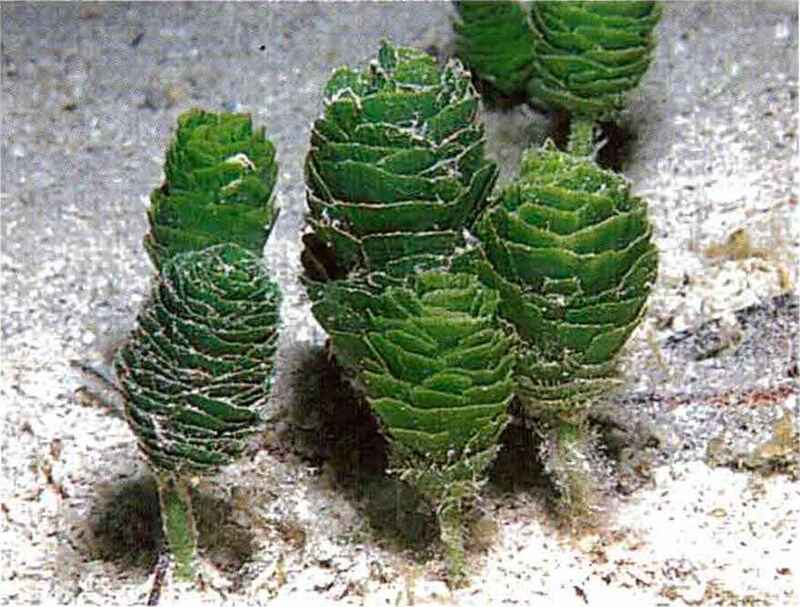 These can be recognized by their tiny polyps in which tentacles are rudimentary or even absent. Clearly, these little guys cannot catch plankton and so depend upon currents to bring nutrients and carry off wastes, while photosynthesis by their zooxanthellae provides calories for growth and development. Upright types grow attached at the base to a rock and should be mounted in this fashion in the aquarium, using waterproof epoxy, unless collected already attached to a suitable base (highly desirable). A number of individuals are now offering propagated gorgonians for sale, usually smaller branches attached to pieces of live rock. Coming from captive stock, these are often hardy and easier to acclimate than wild-collected gorgonians. Bahamian Sea Fan (Gorgonia flabellum): can thrive in a reef tank with vigorous currents. becoming flatter and more platelike with increasing water depth. 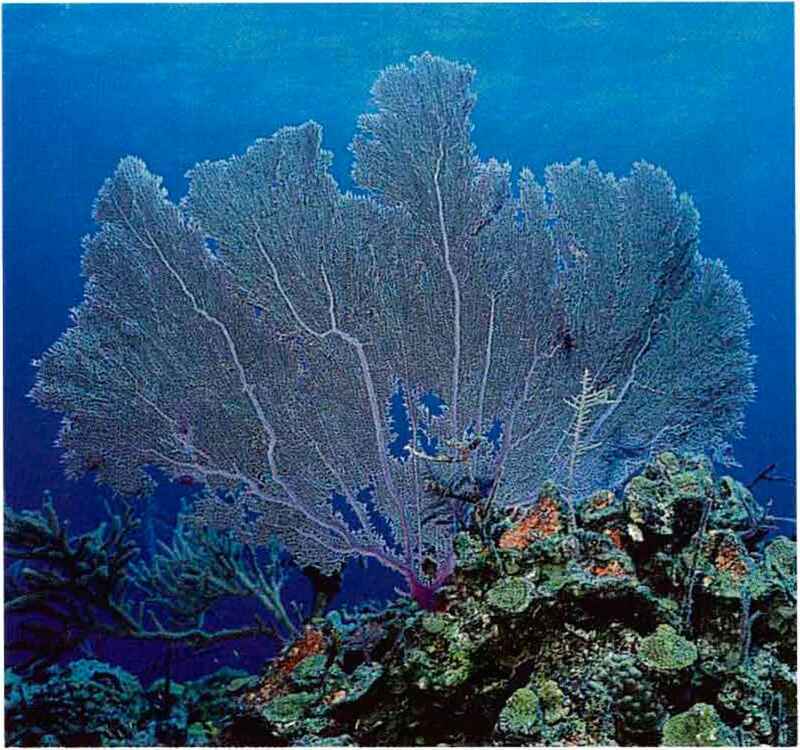 In areas subjected to a great deal of turbulence, as opposed to directional flow, there would seem to be no special advantage to the orientation of the polyps, or indeed of the whole gorgonian, with respect to water movement. In other localities, however, directional flow may predominate, and the polyps might be arranged so that all are "facing into the wind" or, in this case, the current, which brings food and oxygen and carries away wastes and reproductive cells. Sea fans are almost always perpendicular to the prevailing currents, and they are of the flat-stemmed type of gorgonian. 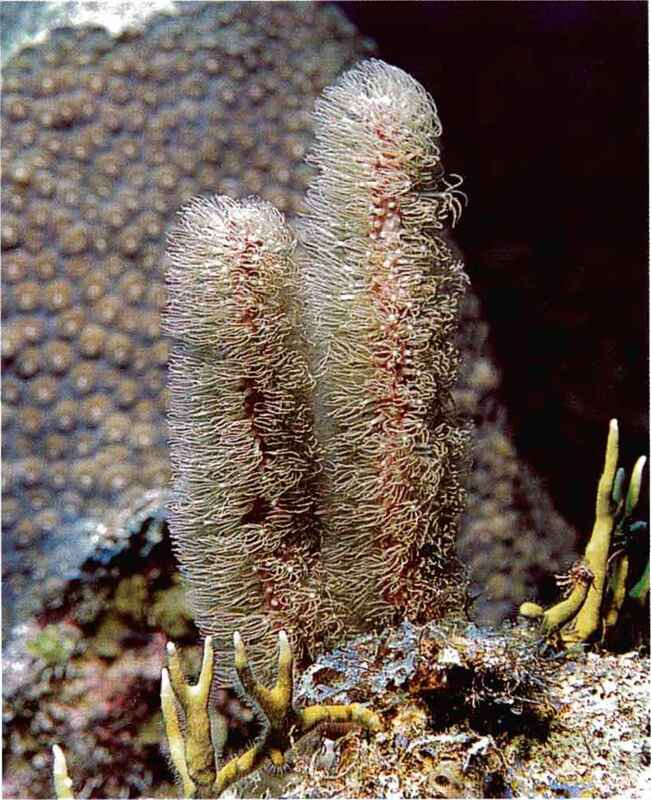 Careful inspection of a sea fan with expanded polyps will show that the polyps are only found on the edges of each tiny branchlet and that all seem to stretch toward the incoming water flow. Placement of gorgonians with attention to these specializations should enhance their likelihood of surviving and growing in the aquarium. Nonphotosynthetic gorgonians are, in my experience, nearly always of the round-branch type, with uniformly distributed polyps, the better to catch food arriving from any direction. MACROALGAE. 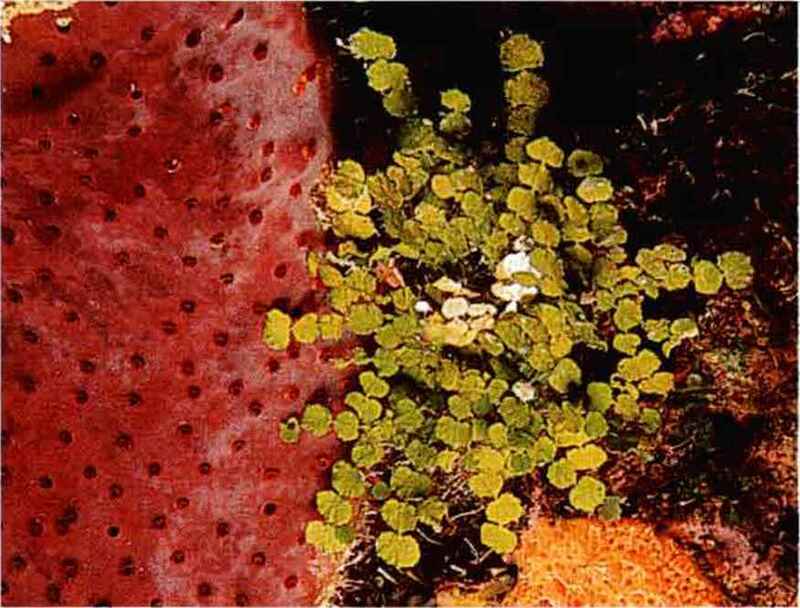 Down among the bases of the gorgonians, calcareous macroalgae fulfill roles similar to those of the shrubs and herbs of the forest floor. Udotea flabelliforme, U. cyathiformis, Penicillus c api tat us, P. dumetosus, Halimeda in-crassata, H. discoidea, Rhipocephalus phoenix, Avrainvillea nigricans, Cymopolia barb at a, Dasycladus vermicularis and Acetabularia crenulata all occur in the gorgonian forest in abundance. Caulerpa, interestingly, is not so common, probably because only a few species of this tropical seaweed can make do with smooth, solid rock for a substrate. 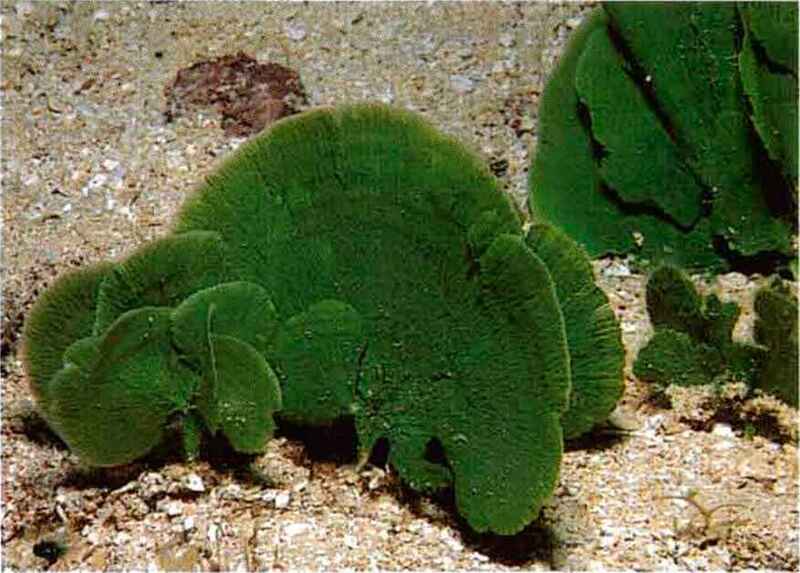 (Rhodophyta) are typified by species such as Gracillaria. by the calcified body structure. 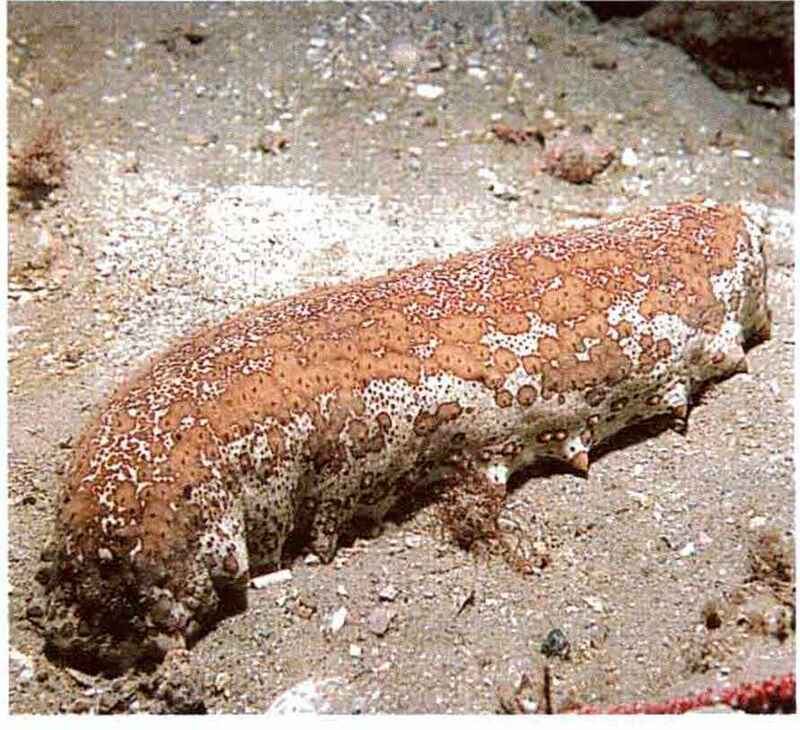 merous other species that live in cool waters, although there ters. 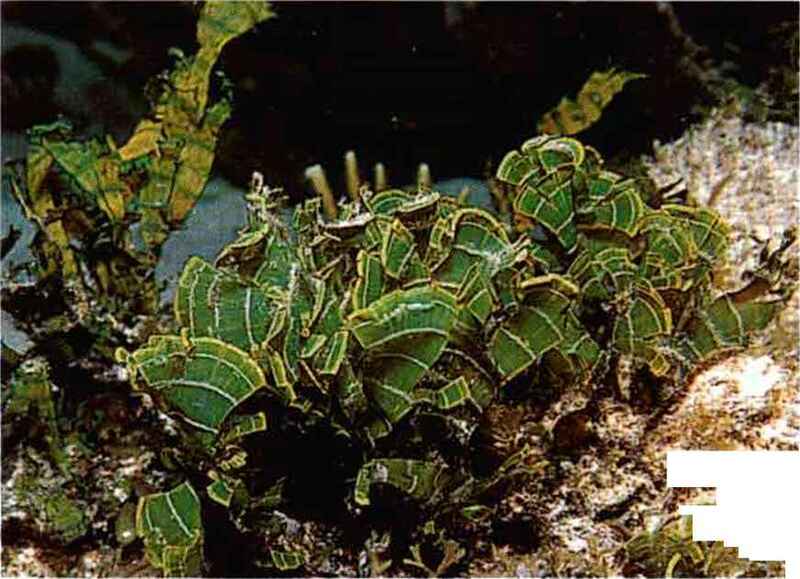 They tolerate low light intensities and are found at are several tropical species, notably Sargassum. tractive, these species indicate by their presence that corals mer. Presumably, the tropical species that are usually found can grow in the tank as well. 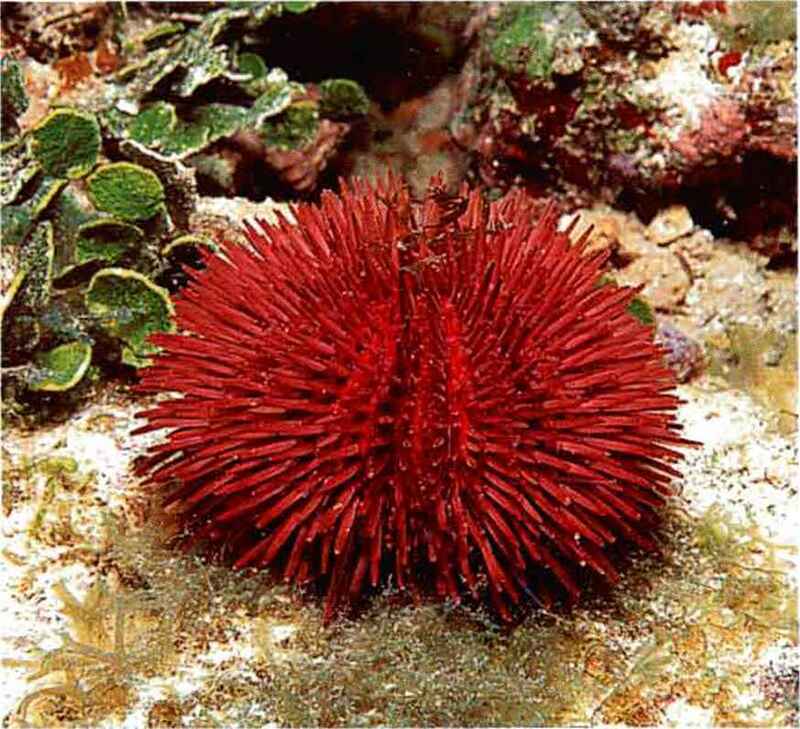 There are two subclasses of Rhodophyta, and one, the round. 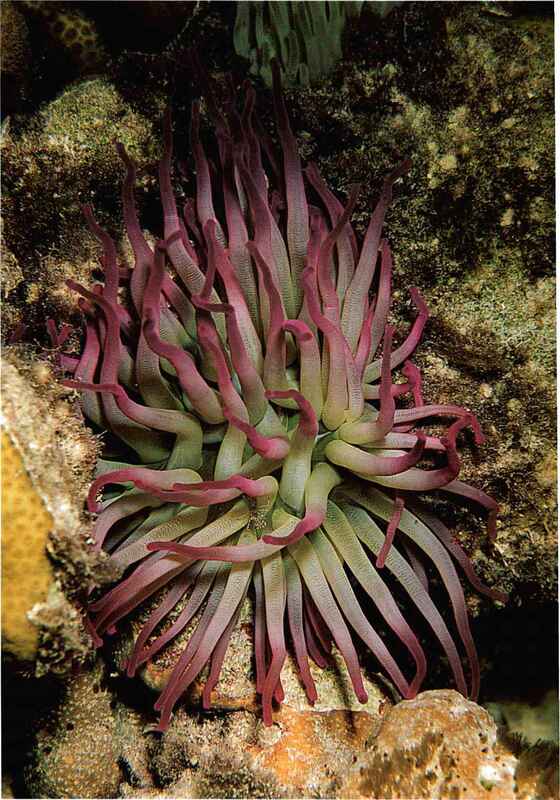 What do Haitian Condylactis sea anemone eat? How do ophionereis reticulata digestive system? Do i have to acclimate a sea fan? What is the rock type of Calcareous Green Algae? What Is The Brine Shrimp Life Cycle? How many queen conch is grown per year?